I’ve been on babysitting duty since Thursday night. I was helping out my BFF by watching her 7 year old daughter, who is an absolute doll!! You might remember Kennedy from her Mini-Hairscapader HairStory. What a great kid. She is so well-behaved. Went to bed, took her baths, brushed her teeth, and practiced her spelling words without so much as an “Ahhhhh man.” LOL! Anywho, although she wasn’t much work at all, I still didn’t do my hair until late on Sunday. Actually, I started in the afternoon by co-washing with a new conditioner that I’ll tell you about a little later. I decided to co-wash as the only thing I used all week was the flaxseed cream gel (FSCG). But, let me tell you, the area underneath my crown to my nape was a NIGHTMARE. Anyone who thinks looser curls are a breeze to detangle needs to see the bird’s nest of matted hair that it took me a good hour/hour and a half to finger detangle. I was close to hyperventilating at one point because the matting was so bad and so high up on the strands, that I thought I was going to have to cut it out. I eventually had to grab a stickpin and use it to create some space in the center of the knot to work out the strands. Ultimately, I didn’t lose much hair at all in the wash process, though I did have to cut two tiny two strand knots out that I couldn’t release. Anywho, I ended up using my shower comb to make certain my hair was thoroughly detangled and free of shed hair. As I stood in the shower, I swore to myself that I would NEVER wear a WnG that long again without co-washing or at least dry detangling with a pre-poo first. As I worked through the masses of matted knots and tangled hair, I imagined that this is what happens when ladies take out braids and wash their hair without getting rid of the gunky, dusty, shed hair at the top of each braid first. I understood why some have resorted to scissors and big chops after such an experience. Okay, this post is longer than I intended. Anywho, I co-washed with this new conditioner, but, because I only had a sample size, I threw HE HH on top of it. I used the shampoo brush to comb through each section of hair (I separated my hair into 6 sections) after I finger detangled. I deep conditioned with Darcy’s Botanicals Pumpkin Seed Conditioner. 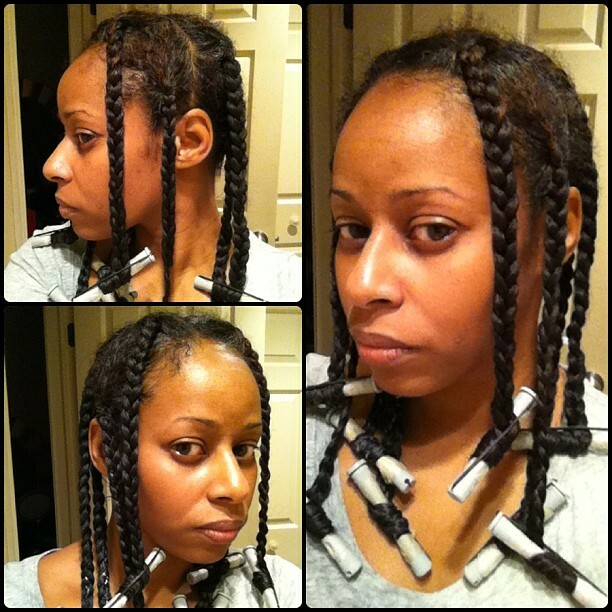 Then, I used Shea Moisture Raw Shea Restorative Conditioner as my leave-in and the FSCG as my styler for a braid-n-curl. However, I started the styling process after 11 pm and didn’t finish until about 12:30 am. So, you know my hair isn’t dry and I’ll be wearing these braids in a ponytail for work!! Okay, gotta go. Have to hit the showers and then drop my little buddy off to school. Love your comment about your looser curls being the hardest to detangle. I’m starting to realize the same thing; my nape area has my looser curls, and they are also the most prone to tangle and wrap around one another. Also, recently I’ve discovered THE BEST (for me!) pre-detangling dc combo ever. On slightly damp hair, I’ll add B.A.S.K. Beauty’s Y.A.M. Nectar honey moisturizer, and on top of that, I’ll add Curl Junkie’s Banana Hibiscus Deep Fix. I’ll throw on my heat cap for an hour or so. I’ll then rinse out a little, add a little Tresemme Naturals (a modification of your cool and seal method!) and begin finger detangling in the shower. Oh boy, that honey/banana/hibiscus mix detangles my hair and makes it shinier than anything else I’ve ever tried. Last weekend, I had a huge knot of matted hair that I didn’t know what to do with. I was scared to cut it out since it was so high up and involved so much hair. After this honey/dc treatment, I couldn’t even find the knot. The oils, emollients and honey had worked it out themselves. LOVE that I’m getting to the point of my natural hair journey where my products are doing the work for me! That’s getting my money’s worth, for sure!